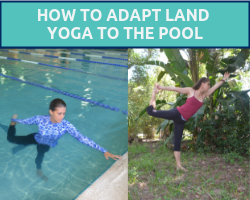 It’s easy to adapt land yoga to the pool is when you keep a few principles in mind. To adapt land yoga to the pool, what are your goals with your postures or asanas? Do you want to look exactly like the cover of Yoga Journal in a posture? Is your goal to make certain muscular actions happen in a posture? What about customizing your practice to meet your needs and make it yummy and supportive of you? If you can get clear on why you’re doing certain postures, and what you want to get out of them, it will help you as your move your practice into the pool. You will be able to emphasize the points that matter to you and practicing in the pool will meet your goals. If your goal in practicing asana is to do postures in the traditional form, the “fullest” expression of the posture, that is totally doable in the pool for many postures. This would literally be moving your practice into the pool. Everything’s the same as ‘traditional’ yoga, you’re just doing it in the water. Here’s a side by side comparison of Dancer’s Pose (Natarajasana) in the water and on land. Standing on one foot is always an option in the pool. I’ve connected my hand to my back foot and I’m hinging forward. The same form, the same actions, the same name. A note about inversions (going upside down). Most people don’t want to do them, so I just usually say that’s off the table. By doing that, we know we’re talking about postures that won’t put your head under water. Also, keep in mind, not every posture is right for every pool. Not every pool has a walk in entry area to do seated postures with your hips under water for example. We’ll talk about that more below. When you move land yoga into the pool are you trying to emphasize similar physical actions? Take Down Dog (Adho Mukha Svanasana) as an example. If we do it in the pool like on land, our head is under water so that’s out. …we can totally do that in the pool. If you compare the two postures, they don’t look exactly the same, that’s true. However, those three physical actions are occuring in both postures. You can break down any posture into the physcial movements involved and use those points to guide you in the pool. When you move land yoga into the pool are you trying to customize your practice and emphasize your needs? All you need is the time to explore how you want to do the postures, and how the different options feel in your body. Not every posture feels the same in the pool so the water gives you a new format to explore personalized movement. For instance, if you’re trying to improve your balance there are many different ways to think about balance and techniques to apply. These two postures above, I would call them by the same name – Locust pose (Salabhasana). On the right, on land, is a very traditional example of the posture. On the left in the water, we’re doing it standing and improving our balance. I’m standing on one leg (challenging my balance). The other leg is behind me on the tiptoes (getting hip extension and contracting my back muscles like on land). I have to keep my torso stacked on top of my asymmetrical base (knowing where my body is in space). I inhale and raise one arm up (using my breath to stabilize myself). The other arm is out to the side (to draw my shoulders back and open my chest like on land). How can you use the unique experience of working in the water to gain something new out of your postures? For example – Goddess Pose. On land Goddess Pose stretches your groins, builds strength in your thighs and opens your hips. In the water, because of the buoyancy, you’re still getting a stretch, but it’s not as much of a thigh workout. If you want to build strength, you challenge your core and your ability to stay grounded by adding water turbulence and resistance from a prop. What do you want your base of support to be? In aqua yoga we can be on our feet, if the pool allows we can be seated, or we can sit on a prop. If you move your seated postures to an unstable base, how does that challenge you in new ways? So you can see how these ideas allow a lot of room for creativity in your practice. There’s a lot less risk when you try something new in the pool. When you try a new posture in the pool, probably the worst thing you’re going to hurt is your pride. Knowing that, be encouraged to try something new. When you adapt your land practice to the pool – Be bold. Be brave. Be big. Have fun!!!! My Intro to Aqua Yoga Online Course is in early bird enrollment. If you want to move your yoga practice into the pool this year, you’ll get four weeks of resources and support to help you put these principles into practice. I look forward to working with you!